When a woman's body prepares for the natural transition between fertility and infertility, hormonal fluctuations can lead to a whole host of uncomfortable and upsetting symptoms. If your mom insists on having the window open in January, yells at you for dropping the milk or forgets what time karate finishes, bear in mind that she's most likely experiencing sensations beyond her control. How Can I Cope with My Mom's Mood Swings? Caused by hormonal imbalance during the menopause transition, a women's hormone levels fluctuate rapidly and significantly affect her mind and body in a number of different ways. Whilst it can be hard to remain understanding and sympathetic when it feels like you're the target of her mood swings, remember that she's struggling with uncomfortable symptoms beyond her control. To make the transition easier for both of you try to be understanding, patient and supportive. It can be hard to stay calm and unfazed when it feels your mom is constantly angry with you but remember, what she's going through is something like puberty backwards. More often than not, her mood swings have nothing to do with the person they are directed at. Caffeine is a stimulant that will worsen a woman's experience of menopause. When you next make your mom a hot drink, opt for naturally relaxing herbal tea such as chamomile. In addition to facing a medley of symptoms that affect both her mind and body, it is common for women going through the menopause to face insecurities about their age and changing bodies. One of the most effective ways of coping with your mom's menopause, and supporting her passage through it, is to demonstrate that you care. Whilst this might seem trying when you feel like she's taking all her frustrations out on you, noticing and verbally acknowledging that she's going through a difficult stage will allow you both to talk about the effects of her experience. Many women find that one of the most effective means of managing the menopause is to stabilize the root cause: hormone imbalance. A simple way of going about this is to lead a healthy lifestyle. Exercise will provide not only short term stress relief but also reduce the risk of contracting some of the more serious conditions that can accompany menopause. However, it can sometimes be hard to stay motivated, help your mom along by becoming her running partner or joining an exercise class together. Whilst mood swings are an inevitable and common aspect of the menopause transition, they can be as hard to navigate for families as they are for the women in question. Understanding that mood swings are a natural and inevitable side effect of your mom's menopause will help you all. 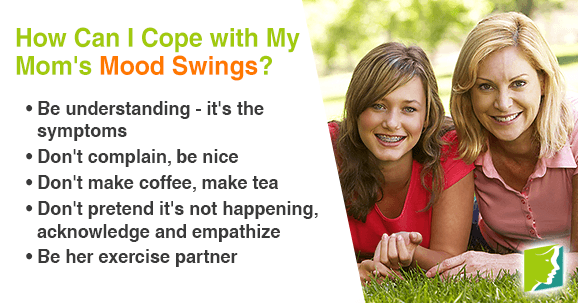 Follow this link for more information on how to handle mood swings.